Original drawing colors (gouaches, ink and colored pencils), by rochette. 24.5 x 24.5 format. 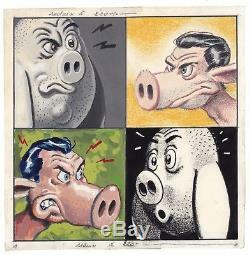 Cover of edmond the pig released by albin michel editions in 1986, unsigned. The item "rochette, original drawing cover edmond the pig 1986. Colors" is on sale since Friday, April 20, 2018. It is in the category "books, comics, magazines \ bd \ boards, original drawings". The seller is "babat67" and is located in / in paris. This item can be delivered anywhere in the world.